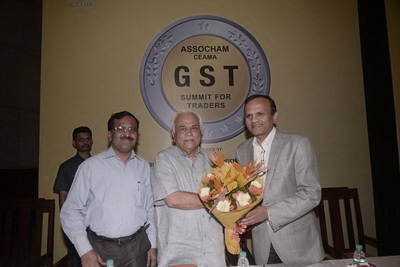 One Nation One TAX- Videocon and ASSOCHAM organized a GST Summit for traders. The summit is headed by Chief Guest Shri. R.V. Deshpande, Honourable Minister for Large and Medium Scale Industries, Department of Commerce & Industries,Government of Karnataka. Shri. Narayan Swamy, Commissioner – Service Tax, Bengaluru also gave his valuable thoughts. Videocon is spreading awareness & knowledge about GST in 200 cities, The national rollout of the ASSOCHAM-Videocon GST Summit went well in bengaluru wtih overflowing crowd. Lot of traders got decent knowledge on GST during this summit and lot of trade doubts were cleared. Being a responsible corporate house, Videocon is committed to serve the industry and all its stakeholders. The company recently launched a digital helpline for retailers, GST@vgmail.in, where consumer electronics retailers can email their queries with regards to GST. Videocon will endeavor to respond with the help of experts within 48 working hours. GST Summit received a tremendous response from traders in Bengaluru. Around 600 Consumer Electronics retailers attended the event who utilized the platform to clarify all their GST queries.